Most of us have done it. Oprah Winfrey was here advocating against it until Indian roads scared her to death. But Jason Torchinsky has come up with an idea that will make texting/ talking on the phone while driving easier and safer. This idea of a CMDL or a Center Mounted Distraction Lamp is lightning flash and we hope some or the other automaker signs up for it. 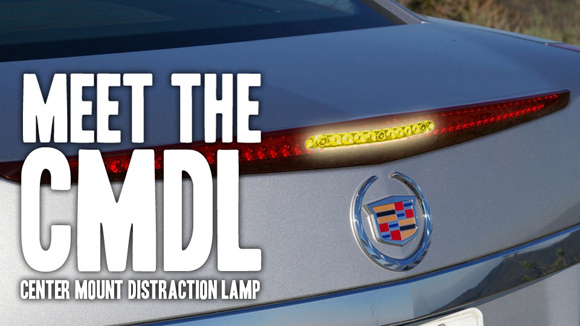 For the average Joe, basically, CMDL is a fluorescent light located bang in the middle of your brake light that explains others that you are though capable of driving, but your focus is also on other things. Say, if you received a call you cannot miss while driving on a highway, you would be in for jeopardy. Neither can you slow down pull over nor can you miss the call. So here’s what you do. You switch on the CMDL, which warns the other drivers of your situation and they can drive more carefully. Adding a cherry to Torchinsky’s cake, we would suggest that a smartphone app be developed that switches on the CMDL as soon as you start SMSing or pick up a call. While this idea is yet in the nascent stages, if some automaker or smartphone manufacturer picks up, it might just be a million dollar baby and it would save thousands of lives especially in a country like ours with the kind of driving. Three Cheers for Torchinsky! No Apple iPads for China!